Ex-NFL player Colin Kaepernick helped start a wave of protests by kneeling during the national anthem to raise awareness to police brutality, racial inequality and other social issues. 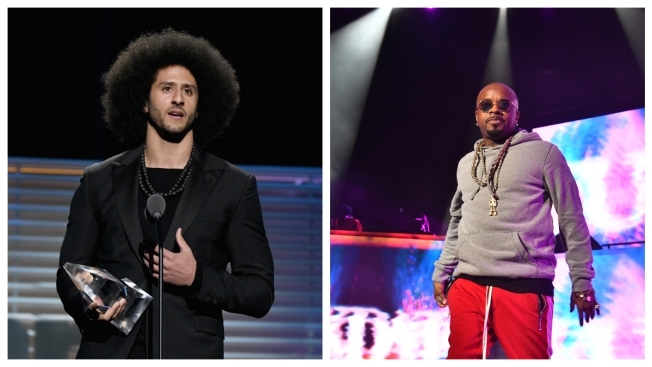 Jermaine Dupri said he was called a "sellout" for hosting a Super Bowl-related event during a meeting with people who had lost family members as result police brutality. After the meeting, Dupri and the victims' family members came to a compromise. The music mogul plans to give mothers a platform to speak onstage during his Super Bowl Live event in Atlanta. He hopes to bridge the gap between speaking out against social injustice and accommodate the NFL during his five-night concert series starting Saturday. Some of the families were looking to boycott the Super Bowl and initially Dupri's event in the city that many consider the birthplace of civil rights. "I met with the families and parents who have been killed and murdered by police officers here," the 46-year-old longtime Atlanta resident said. "I plan on having them come to my Super Bowl Live event and speak to the crowd and tell their story about police brutality in the city and let people understand that I'm supporting them as much as possible." Dupri was initially criticized after he partnered with the Super Bowl host committee to produce a series of free concerts at Centennial Olympic Park, located a couple of blocks from where Super Bowl 53 will be held at the Mercedes-Benz Stadium. The Super Bowl is one of the world's biggest sporting events. But some are looking to boycott the big game after the halftime show has been the topic of a heated debate since Kaepernick, who has not been signed by an NFL team, said he would not stand for the national anthem in protest of racial discrimination against blacks in the United States. Last summer, the NFL implemented a league-wide policy that players must stand for the national anthem . Some, including Rihanna and Pink, have reportedly turned down offers to perform during this year's halftime. Jay-Z alluded to his feelings in a recent song that he declined to perform at the Super Bowl, and Amy Schumer refused to appear in a TV ad during the game. Cardi B said she won't take the Super Bowl halftime stage until Kaepernick gets a job, but she will perform at a downtown concert next week. Gerald Griggs, vice president of the Atlanta chapter of the NAACP, has said the NAACP asked performers who signed up to reconsider their participation. Through the petition, he wants acts like Maroon 5 to withdraw from the Super Bowl "until the league changes their policy and support players' constitutional right to protest." In a recent interview with The Associated Press, PJ Morton, Maroon 5's keyboardist, said he felt the heat of his band's decision to perform . The NFL and Scott gave $500,000 to the Van Jones' Dream Corps, which works on criminal justice reform and expands opportunities for diversity in technology, environmental issues and education. But despite his charitable efforts, Scott fell in the social media crosshairs with the Rev. Al Sharpton, and rappers Common and Meek Mill. Dupri, though, called Scott's initiative with the NFL a "forward movement." "If he did something to bring attention to police brutality or injustice, I think that's a step forward in the fight that everybody seems to want to talk about," he said. Dupri said he's facing the same kind of criticism from skeptics calling him a "sellout" for putting on his Super Bowl Live event. He supports Kaepernick's efforts, but wants to provide a major platform for Atlanta music artists to perform in front of thousands. "If we were to completely turn our head to what's happening Super Bowl weekend and have nothing to do with it, and stand with Kaepernick and completely boycott, what about our love and our craft that we care so much about?" Dupri said. "It's a rough situation, because you want to support both sides." "Imagine #TrayvonMartin having a chance to tell his side of the story," she wrote this week. "Imagine media searching for a better view on #MikeBrown's behalf. Imagine the Peace Warrior Organization, a group of youth in #Chicago working to stop violence, being invited to the White House this week." Atlanta's NAACP will give people a platform to speak, but separate from the NFL. Griggs said the organization will hold a rally to address police brutality and racial disparity in the criminal justice system the day before the Super Bowl at Clark Atlanta University. He said the rally is focused on implementing safer methods for police to enforce the law. Meanwhile, Dupri has a concert series to put on. He knows he can't please everyone. Even some of the family members of police brutality victims were hesitant to participate with him this week. "I want to bring awareness to the situation, and let people to know that we're not out here partying and not caring about their situation," Dupri said. "They told me that they didn't want to come to my show. They're pretty much boycotting the Super Bowl. We had a meeting and came to an understanding. I want them to have a platform to speak."